In every interaction, every conversation and in every thought, you have a choice – to promote peace or perpetuate violence. International peacemaker, mediator and healer, Dr. Marshall B. Rosenberg shows you how the language you use is the key to enriching life. Take the first step to reduce violence, heal pain, resolve conflicts and spread peace on our planet – by developing an internal consciousness of peace rooted in the language you use each day. 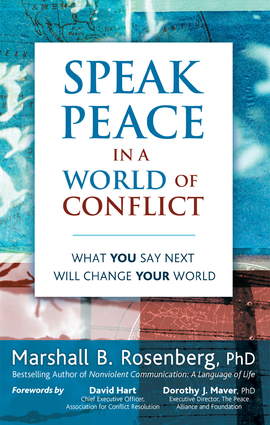 Speak Peace is filled with inspiring stories, lessons and ideas drawn from over 40 years of mediating conflicts and healing relationships in some of the most war torn, impoverished, and violent corners of the world. Speak Peace offers insight, practical skills, and powerful tools that will profoundly change your relationships and the course of your life for the better. Bestselling author of the internationally acclaimed, Nonviolent Communication: A Language of Life. Discover how you can create an internal consciousness of peace as the first step toward effective personal, professional, and social change. Find complete chapters on the mechanics of Nonviolent Communication, effective conflict resolution, transforming business culture, transforming enemy images, addressing terrorism, transforming authoritarian structures, expressing and receiving gratitude, and social change. Marshall B. Rosenberg, PhD is the founder and educational director of the Center for Nonviolent Communication. Deemed international peacemaker, mediator and healer, he spends more than 250 days each year teaching these remarkably effective communication and conflict resolution skills in local communities, at national conferences and in some of the most impoverished, war-torn areas of the world. He is based in Wasserfallenhof, Switzerland.